"An organism that lives on or in an organism of another species, known as the host, from the body of which it obtains nutriment." 1). Banks that provide government guaranteed student loans. The house voted yesterday to end its four-decade practice of subsidizing private lenders to make student loans. Since the 1960's, the government has subsidized banks to lend students money and guaranteed lenders against loss if students defaulted. But since the early 1990's the government itself has done direct lending for many student loans and avoided paying the subsidy to the banks. Why, after all, should banks take a percentage of every dollar to generate loans if the taxpayers guarantee the loan in full? In fact, it turns out that the government - which, after all, has a responsibility to provide higher education to its citizenry - can provide loans directly at a much cheaper price than it can through the banks.In fact it's estimated that eliminating the subsidy to the banks will save $40 billion that can be transferred into the Pell Grant program that provides college grants to moderate and low income students. 2). Private military contractors that provide security services. One of the things that defines civilized society is that the government has a monopoly on the use of lethal force. Yet over the last decade private military security firms have exploded. They have been hired with increasing frequency to do essentially governmental security functions. We've seen the results in the murders of civilians by Blackwater operatives in Iraq. And the growth of free-standing, mercenary armies that are available for hire by governments around the world is a danger to international security. But these contractors are also economic parasites, since they charge a great deal more to do functions that could otherwise be performed by the government. In fact, most of their personnel are trained by the American military. After they leave the service and go to work making much more than they would if they re-enlisted for another turn with the Army or Marines. Then, the Blackwaters of the world turn around and bill their people out at huge markups so that the taxpayers - who paid for their training in the first place - have to pay a corporation for the privilege of hiring them back at much higher rates. 3). Private health insurance companies. These are the granddaddy of all parasitic operations. Remember that every other industrial society has long since decided that financing the health care of its citizens is an inherently governmental function - that it is cheaper and much more consistent with our values - to provide health care to all as a right. Remember that health insurance companies don't provide an iota of health care services. They do hire an army of claims agents to deny claims for coverage, and another army of salesmen and admen to sell yo u policies that you would automatically have in most other countries. They simply take your money, skim off profits and CEO salaries and then - once they get their end - pay for your health care. We know that the one thing government does very well is to spread risk -manage insurance pools. Medicare and Social Security are two of the most successful programs in history. And the health care financing authorities in countries like France and Spain are pretty good at it too. The so-called "Medicare Advantage" program is a great example of a side-by-side comparison of how the private insurance companies compare with government run insurance programs. Medicare Advantage was set up by the Bush Administration and Republican Congress to allow=2 0private insurance companies to skim off a share of Federal Medicare dollars. Originally, the private insurance companies claimed they would provide these services more efficiently than the "government." But it turned out they required a 14% to 19% subsidy above the normal costs of Medicare. As the Economic Policy Institute has pointed out, "In a nut shell, Medicare Advantage plans are private plans funded through Medicare to provide similar benefits, but at a 14% higher cost on average, according to the Medicare Payment Advisory Commission (MedPAC), an independent Congressional agency. Eliminating these overpayments would free up $157 billion over 10 years, a substantial down payment on health care reform." Now the private insurance industry is battling toot h and nail to prevent a public health insurance program from competing for its non-Medicare business. They want to continue to skim their share off of every health care dollar they can.In fact, they hope that the final insurance reform bill will require people to buy their products without any competition from a public plan or rate regulation to limit the amount they can skim into the hands of Wall Street investors and CEO's. That's why President Obama has proposed that the final health insurance reform bill include a robust public health insurance option that doesn't leave us with a mandate to buy insurance from a monopoly of private insurers (that are, by the way, also exempt from the anti-trust laws). That would just guarantee a government-mandated stream of revenue on which the private insurance companies can feed. Of course, corporate parasites like these have always existed. But they have burgeoned over the last several decades as some of the best and brightest graduates of our universities have been convinced that they would be "chumps" to go out and create products and services that provide value to the economy. Much better to work for a corporate parasite that can make huge sums of money simply by convincing government to keep directing huge streams of revenue through its corporate coffers and then slicing off its share as the money comes by. 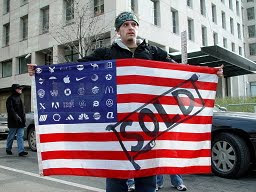 It's time for the age of the corporate parasite to come to an end - otherwise, we're the "chumps".